Corrigendum-III, Extension of last date and opening of bid for the Tender fo r supply of Two Heavy Duty Multifunctional Printing Machines, A3 Size, (Speed 120 Copies Per Minutes or Above). Corrigendum-II, Extension of last date and opening of bid for the Tender for supply of Two Heavy Duty Multifunctional Printing Machines, A3 Size, (Speed 120 Copies Per Minutes or Above). Declaration of L-1 rates for the formation of panel of printers for the printing of 1. DRSC reports, 2. 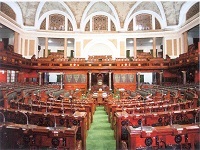 Lok Sabha Debates, and 3. Pre-printing work. Extension of last date and opening of bid for the Tender for supply of Two Heavy Duty Multifunctional Printing Machines, A3 Size, (Speed 120 Copies Per Minutes or Above) have been extended. E-TENDERING FOR AWARD OF CONTRACT FOR RECONDITIONING/REMANUFACTURING OF EMPTY TONER CARTRIDGES OF DIFFERENT SPECIFICATIONS. Tender- Procurement of Photocopier Paper (White, A-4 size, 7 GSM) on Urgent Requirement. Tender document for printing of DRSC Reports, Lok Sabha Debates and pre-printing Work. Annulment of Tender-Procurement of White Photocopier Paper A-4 size,75 GSM to Lok Sabha Secretariat on Annual Rate Contract basis(2018-19). Corrigendum V -Extension of last date for submission of Bids-Procurem ent of Paper Stationery Items and Printing Papers of different col our for t he year 2108-19 on Annual Rate Contract Basis. Corrigendum IV -Extension of last date for submission of Bids-Procurement of Paper Stationery Items and Printing Papers of different colour for t he year 2108-19 on Annual Rate Contract Basis. Corrigendum III -Extension of last date for submission of Bids-Procurement of Paper Stationery Items and Printing Papers of different colour for the year 2108-19 on Annual Rate Contract Basis. Corrigendum -Extension of last date for submission of Bids-Procurement of Paper Stationery Items and Printing Papers of different colour for the year 2108-19 on Annual Rate Contract Basis. TENDER FOR ANNUAL MAINTENANCE CONTRACT OF TELEPORT AND ITS ASSOCIATED CHAIN OF EQUIPMENT. Corrigendum-Extension of last date for submission of Bids-Procurement of Paper Stationery Items and Printing Papers of different colour for the year 2108-19 on Annual Rate Contract Basis. Corrigendum-Extention for Submission of Bids for Procurement of White photocopier paper (A-4 size, 75 GSM) on Annual Rate Contract Basis for the Year 2018-19. Procurement of Full Scape Photocopier Paper(White, 75GSM). Procurement of Photocopier Paper(White, A-4 size, 75 GSM) on Urgent Basis. Tender Extension Notice- Disposal of old/obsolete office machines, equipment, spare parts, consumables, accessories, etc. Tender Extension Notice- Disposal of old/obsolete office machines, equipment, spare parts, consumable accessories, etc. Clarifications on technical specifications and terms and conditions in respect of tender notice published on 13.04.2018 for procurement of security equipments. TENDER FOR DISPOSAL OF OLD/OBSOLETE OFFICE MACHINES, EQUIPMENT, SPARE PARTS, CONSUMABLES, ACCESSORIES, ETC. Tender for procurement of Security Equipments(XBISs, DFMDs,NLJDs). Retender for the Procurement of Paper and other miscellaneous items. Tender for supply of Paper and other items. Corrigendum:2-Disposal of Old/Obsolete Office Machines, Equipment, Spare Parts, Consumables, Accessories, etc. Corrigendum-Disposal of Old/Obsolete Office Machines, Equipment, Spare Parts, Consumables, Accessories, etc. Conduct of Typing Test(Hindi and English) on 24.02.2018 for filling up vacancies for the post of Junior Clerk in Lok Sabha Secretariat on Direct Recruitment basis - Extension of Last date for submission of Quotations. Procurement of Paper and Paper Based Stationery item to be opened on 24.01.2018 at 1600 Hrs. Procurement of SS Pulp Board (SHB) (JK Paper Brand, size 22"x28", Weight 285 GSM). E-TENDER FOR DISPOSAL OF OLD/OBSOLETE OFFICE MACHINES, EQUIPMENT, SPARE PARTS, CONSUMABLES, ACCESSORIES ETC. Procurement of lamination pouch and identity card holder clip (as per sample). Corrigendum - Tender for supply of Digital Video Cassettes (DVC Pro) of different duration. Inviting Quotations for Conduct of Typing Test (Hind and English) for filling up vacancies for the post of Junior Clerk in Lok Sabha Secretariat on Direct Recruitment basis. Seeking of Expression of Interest for Digitization of Video Recordings of Lok Sabha Proceedings. Corrigendum in the tender for supply of Souvenir items for the use of Lok Sabha Secretariat on Annual rate contract basis - Date Extension. Procurement of Writing and Erasing items for Lok Sabha Secretariat on annual rate contract basis. Procurement of Various types of folders. Procurement of New Year Items (Specified items for officers and staff members of Lok Sabha Secretariat). Date of Financial Bids Opening- Tender for supply of consumables for Digital Duplicators and heavy duty photocopiers on annual rate contract basis. Date of Financial Bids Opening- Tender for supply of photocopier machines of different capacities under annual rate contract basis. Date of Financial Bids Opening- Tender for procurement of consumable items for computers and fax machines under annual rate contract basis. Corrigendum in the tender for supply of readymade livery items - Change in EMD amount. Tender Notice for procurement of All-in-one Desktop Computers and services of Resident Computer Hardware Engineer. Inviting Sealed Quotations for Preparation, Supply and processing of OMR Sheets. Tender for installation of Movie Magic Software (Photoshop) system with cable connections at five locations i.e. 04 Committees Rooms and VIP entrance gate in Block A Extension to PHA in Parliament House, annual maintenance of Movie Magic Software (Photoshop) system already installed at 11 placed in Parliament House Complex and provide/feed the digital information of committee meetings (English and Hindi) on both the systems (to be installed and already installed). LIMITED TENDER FOR PROCUREMENT OF READYMADE LIVERY ITEMS. Award of Tender for disposal of old/obsolete computer hardware and peripherals. Disposal of old/obsolete computer hardware and peripherals. Tender for AMC contract of NEC. 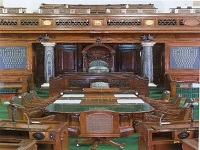 ASPILA EX Key Telephone system from Lok Sabha Secretariat. 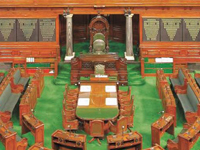 Inviting Quotations in connection with conduct of Stenography Test for filling up the vacancies for the post of Parliamentary Reporter Grade-II in Lok Sabha Secretariat on Direct Recruitment Basis. Clarifications on Technical Specifications and Terms and Conditions in respect of Pre-bid meeting held on 04-01-2017 under the Limited Tender for Procurement of Indoor Cell Phone Jammers. Limited Tender for Indoor Cell Phone Jammers. Tender notice for supply of envelopes on rate contract basis - extension of time for submission of bids / quotations upto 22.12.2016. Tender notice for supply of envelopes on rate contract basis - extension of time for submission of bids / quotations upto 09.12.2016. Tender extension notice for supply of envelopes on rate contract basis. Limited Competitive bidding for awarding Comprehensive Maintenance Contract (CMC) for printing/binding machines like Graphic Semi Automatic Paper Cutting Machines, Screen Printing Machines, Creasing Machines, Perforated Machines, Wire Stitching Machines, etc., installed in Rotaprint/Bindery Section of LSS. Clarification in respect of Tender for procurement of indoor cell phone jammers. Tender for procurement of indoor cell phone jammers. Preparation of backdrops for 14 programmes of LSTV under two bid system. Quotation for Supply of Pouch Lamination Machine (Small Size) capable to Laminate 250 Micron pouch sheet. Procurement of Technical Security Equipments. Procurement of two new blades (imported) for cutting machine, 42" (Motorized). Extension of time for Quotation for supply of envelopes on rate contract basis. Quotation for supply of envelopes on rate contract basis. Corrigendum VI Limited Tender for the supply of consumables for computes and fax machines on rate contract basis. 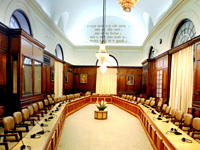 Corrigendum - III, Limited tender for procurement of consumable items for computer and fax machines under rate contract agreement. Corrigendum:- Open Tender for the Procurement of Photocopiers Machines to LSS and extension of date for opening of Financial bids. Corrigendum for tender for supply of Hewlett-Packard (HP)brand toner cartridges of different sepcifications. Sealed Quotations - Services of Institute/Centre equipped with Computer Labs/ terminals/Printer , etc. 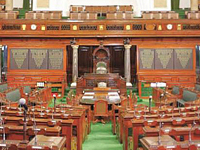 required for conducting the Stenography Test (on 13.09.2015) for filling up the vacancies to the post of Stenographer in Lok Sabha Secretariat. Advertisement No. 1/CMB/(HW)/2015 - Tender for Procurement of Blade Server, Blade Enclosure, Rack, Unified Storage Area Network(SAN), SAN Switches, Virtual Tape Library and Related Software - list of technically qualified bidders. Corrigendum-II-Quotation for 'Recasting of old type metal intro new for Leaf Printing'. Limited competitive bidding for awarding annual contract for reconditioning/remanufacturing of HPQ2612A and HP CC388A toner cartridges. Inviting Quotations for Preparation, Supply and Processing of OMR sheets. Corrigenda- Tender for the procurement of Blade Servers, Blade Enclosure, Rack, Unified Storage Area Network(SAN), SAN Switches, Virtual Tape Library (VTL) and Related Software. Corrigendum- Tender for the procurement of Blade Servers, Blade Enclosure, Rack, Unified Storage Area Network(SAN), SAN Switches, Virtual Tape Library and Related Software. Procurement of Blade Servers, Blade Enclosure, Rack, Unified Storage Area Network (SAN), SAN Switches, Virtual Tape Library etc. Corrigendum No. 3 - Limited tender for supply of spiral/wiro binding machine to Lok Sabha Secretariat. 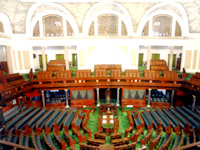 Limited tender for shoes for officers/staff of Lok Sabha for the year 2015. Procurement of Various Types of Envelopes to Lok Sabha Secretariat. Extention of date of limited tender for procurement of Addressograph machine. Limited Tender for the Procurement of Variou Types Folder to Lok Sabha Secretariat On Rate Contract Basis. Limited tender for supply of Raincoats and Rain suits for the officials of Lok Sabha Secretariat. Limited tender for supply of Digital Video Cassettes Professional (DVC Pro) of different durations and consumables for computers and fax machines on rate contract basis. Limited Tender for supply of reconditioned toner cartridges on rate contract basis. CORRIGENDUM in regared to "Open Tender for the procurement of Black Leather Shoes, Bellies and Black Cotton Socks for Officers/staff of Lok Sabha Secretariat for 2014"
Corrigendum of Limited Tender for procurement of Cover Jacket of DVC Pro of different durations. Contract for lifting waste paper from Lok Sabha Secretariat. Limited Tender for supply of Cover Jackets for Digital Video Cassettes Professional (DVC Pro) of different durations to Lok Sabha Secretariat. Extension of tender notice period for hiring of single Maruti SX4/Dezi re (AC) Car for transportation of officer from Sector-14, Sonepat to Parliament House, New Delhi. Procurement of Parker Pen Set (Victor). Postponement of Financial Bid regarding Tender No.7/4/Comp (HW)/2011 for procurement of Blade Server/Chassis for Blade Server/Rack Server/Rack/Heavy Duty Scanner. Tender notice for procurement of Blade servers/Chassis for Blade server/Rack server, etc. Extension of Tender period for Hiring of single Maruti SX4/Dezire (AC) Car for transportation of officer from Sector-14, Sonepat to Parliament House, New Delhi. Limited competitive bidding for awarding annual contract for washing of towels, dusters and car seat covers of Lok Sabha Secretariat. Hiring of single Maruti SX4/Dezire (AC) Car for transporation of officer from Sector-14, Sonepat to Parliament House, New Delhi. Invitation of quotation/expression of interest for the processing of the Applications received for various posts vide advertisement no Advt. No. 1/2013 brought by the Lok Sabha Sectt on its website. Procurement of Green Photocopier Paper (A-4, 80 GSM). Procurement of Catalogue Cards for Printers. Extension of last date for submission of bids for the supply of briefcases. Invitation of quotations for Plastic Folders (CH-117, with Printing). corrigendum regarding procurement of Briefcases for Lok Sabha Secretariat on rate contrcat basis. Addendum to open tender for procurement of Stationery and Other Items(2). Open tender for Procurement of Stationery and Other items On Rate Contract Basis. Corrigendum regarding procurement of crockery, cutlery and other related items under Open Tender for Lok Sabha Secretariat. Limited tender for procurement of brief cases for Lok Sabha Secretariat on rate contract basis. Limited Tender for Procurement of Paper Stationery Items. Addendum to the Open Tender For Stationery and other Items on Rate Contract Basis. Quotation for punching machine (single hole). Corrigendum reagrding Open Tender for Supply of Paper and Paper Based Stationery Items To Lok Sabha Secretariat on Rate Contract Basis. Limited Tender for the Supply of Sanitary Items to Lok Sabha Secretariat on Rate Contract Basis. Open Tender for Supply of Paper and Paper Based Stationery Items To Lok Sabha Secretariat on Rate Contract Basis. Limited Competitive bidding for awarding annual contract for reconditioning/remanufacturing of HP Q 2612A and HP CC388A toner cartridges. Tender notice inviting quotations for heavy duty punching machines. 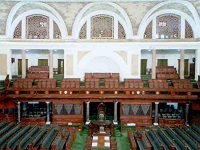 Empanelment of companies/ Firms for undertaking fabrication of backdrop/ professional TV presentation set for the Lok Sabha Television. Tender Notice for Supply of Hewlett-Packard (HP)Brand Toner/Inkjet Cartidges of Different Specifications to Lok Sabha Secretariat, New Delhi. LIMITED COMPETITIVE BIDDING FOR SPECIFIED ITEMS FOR OFFICERS/STAFF OF LOK SABHA SECRETARIAT. Limited Tender Enquiry for Procurement of Black Leather Shoes, Sandals, Bellies for the officials of Lok Sabha Secretariat.